What type of bag do you use? How many times are you going to use it? How many bags do you throw away every week? Cotton tote bags - are they so eco-friendly? 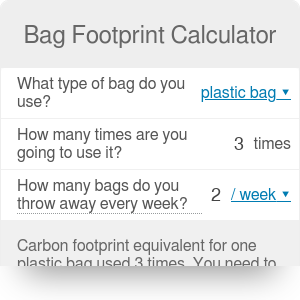 With our bag footprint calculator, you can find out how many times you need to use your bag to have the same carbon footprint as the other types of bags. We will try to resolve your doubts about plastic bags, reusable shopping bags and paper bags footprint. If you're curious how many times your stylish cotton tote bags must be used to generate the same global warming potential as plastic bags, don't wait any longer, give this calculator a go! Our bag footprint calculator is based on the data from Environment Agency report from 2011.
pollute the oceans and choke animals 🐢 - whales, turtles, marine birds and many others. are not easy to recycle ♻️ - only 1% of plastic bags is recycled. are produced from oil ⛽ - plastic production accounts for 0.2% of the earth's oil consumption each year. So what can we do? What are the alternatives? Paper bags are used more and more often, as many cities and countries are starting to introduce charges for plastic bags or even total bans, as France did in 2016. We associate the paper bags as a green alternative to plastic bags because they are made from paper, made from trees, which is obviously a renewable resource - how could it be bad for the environment? Unfortunately, the paper bags are not the best option - they tear easily, so it's not possible to reuse them many times, their production creates 70% more air pollution than plastic bag production and they weigh more and take up more space, so the transportation cost is much higher. One can argue, that at least they don't pollute the oceans and can degrade quickly. Yes, that's true, but only partially - surprisingly, the paper that ends up in landfills doesn't degrade substantially faster than the plastic bags! That's because the landfills conditions are not made for paper degradation, so piled-up rubbish lacks water and oxygen needed for degradation. That's why the bag's end-of-life is so important - even choosing the bag made from natural sources like paper may be harmful to the environment if we don't recycle it properly. Unfortunately, cotton and linen bags are not so green as many think. Although they are made from plants - the natural and renewable resource - their carbon footprint is high mainly because of the material production. They need to be used more than 131 times to have lower global warming potential than conventional plastic bags - that's a lot, even for a reusable shopping bag. So which bag is the best? It's the question impossible to answer! If you are looking at the general environmental impact, the plastic bags have the smallest carbon footprint. Whether landfill problem is the thing you care the most, biodegradable or paper bags are the best option as they can be composted and their degradation takes couple months in favorable conditions. The LDPE reusable bag, when used more times, has lower impact on acidification, aquatic ecotoxicity, and photochemical oxidation than a standard plastic bag. Cotton tote bags have a massive carbon footprint because of energy and fertilizers used to produce cotton yarn (and this also applies to our clothes). However, the negative impact can be reduced by organic cotton & canvas bags and reusing the bag as many times as possible. Hmmm... We are caught between a rock and a hard place. But wait, hey, we are mistaken! It IS possible to answer the question above - the best bag is the one you didn't take! Try to refuse the bags and rethink your everyday choices: do you really need that paper bag for the T-shirt you just bought or can you put it directly into your backpack? And that hand of bananas, does it need to be tightly wrapped with thin plastic bag? Bag Footprint Calculator can be embedded on your website to enrich the content you wrote and make it easier for your visitors to understand your message.